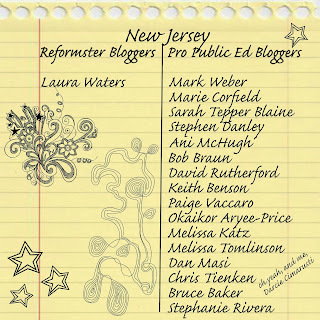 It's gotta be hard to be NJ's only reformster blogger. I mean, just look at the tally sheet. And this is just the bloggers I can think of off the top of my head and doesn't include amazing guest bloggers I've had on my blog like MoNeke Ragsdale, Sue Altman, and Julie Borst. It also doesn't include the Cares groups that have sprung up all around the state, or groups like the Newark Parents Union and the Newark Students union, or even Save Our Schools NJ - the pro public ed parent group that makes poor Waters see red and completely lose her faculties on a regular basis. Waters has been all alone waving her flag for charters, choice, and testing for as long as I can remember, and she's gone after SOSNJ more times that I care to link to. It's all become a bit of a bore to be frank. But when she went after Sarah Tepper Blaine yesterday my interest was piqued. Why you may ask? Isn't this just par for the course with Waters? Sarah is a new and interesting target for Waters, and Waters has a new and interesting role in the reformster landscape. You see, Waters is now a pen for ire for Eli Broad's Education Post. The amazing Edushyster recently interviewed Education Post's creator, Peter Cunningham. Read the whole interview to get the real sense of what's what, but here's an important snippet. How can Team Reformster get out their message when they are so often severely outnumbered if not completely alone like Waters here in NJ? Why, they can seek out the megaphone provided by billionaires like Eli Broad (who has dumped 12 million dollars into Ed Post) and Peter Cunningham, former Assistant Secretary for Communications and Outreach with the U.S. Department of Education. Not only was Cunningham Arne Duncan's communications flack, he's his buddy as well. Cunningham worked with Duncan in Chicago, and came with him and Obama to DC. This is all very personal for Cunningham. But what does this all have to do with Sarah? Allow me to explain. New York principal Carol Burris has also gotten a lot of national attention on the Answer Sheet blog where she has regularly decimated the Common Core and advocated for the opt out movement. Unsurprisingly, Burris was the first target of an Education Post swarm of pens for hire (see all of the posts here) and don't miss Curmudgucation's take on the whole mess. All this makes me wonder, will Waters bring her critique of Sarah national in an attempt to discredit another Answer Sheet guest blogger with a national audience? Smart money says yes. 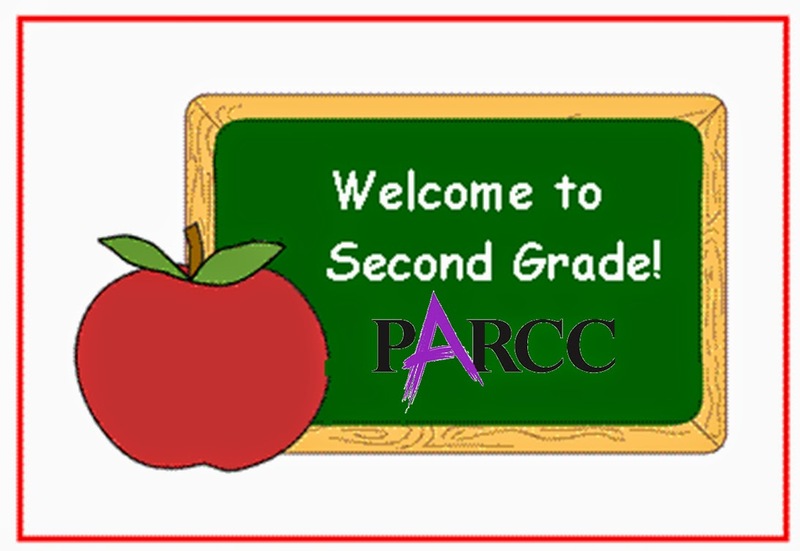 It has become clear that the strong uprising against PARCC in NJ has attracted the attention of national groups, as evidenced by unsolicited opinion pieces by national reformsters appearing in the papers and on the websites of our states' media outlets. See recent examples from Education Trust president Kati Haycock here and Team Michael (Petrilli and Brickman), the president and national policy director of the Thomas B. Fordham Institute, here. To be sure, these changes are not easy, but we hope New Jersey will not turn back now, and will continue on a path to providing high, measurable goals for all students. The state's educators and students have worked too hard, for too long, to climb the mountain to higher expectations to turn around just as the summit comes into view. Looks like since Waters is the lone blogger for Team Reformster in the state they have to bring in the hired guns to try to control the narrative. The anti-reform Jersey consortium isn’t that big, but it’s really well-organized. We all know the names: Bob Braun, Mark Weber, Marie Cornfield, Julia Sass Rubin, Stephen Danley, Bruce Baker. (Sorry if I’ve missed a couple.) Just about all of them are connected, in one way or another, to NJEA and Save Our Schools-NJ. Waters missed more than a couple, (see above) and she has it kind of backwards. Our "consortium" IS really big, a whole hell of a lot bigger than hers to be sure, and it is Team Reformster that tends to be really "well-organized." After all, Waters has We Raise NJ, (and looky there, her posts are on that website too!) and all the money and organizational capacity that comes from an alliance with trusted education leaders like the Chamber of Commerce and the New Jersey Business and Industry Association! But don't worry parents and teachers, We Raise NJ has pledged that "students are more than their test results" and that they "respect teachers' and families' responsibility to make academic decision for students!" I guess the good folks at We Raise NJ just wish the NJ education blogosphere would pipe down a bit about the academic decisions we make for our students. We have the numbers, but they have money and the connections to our government and our media. 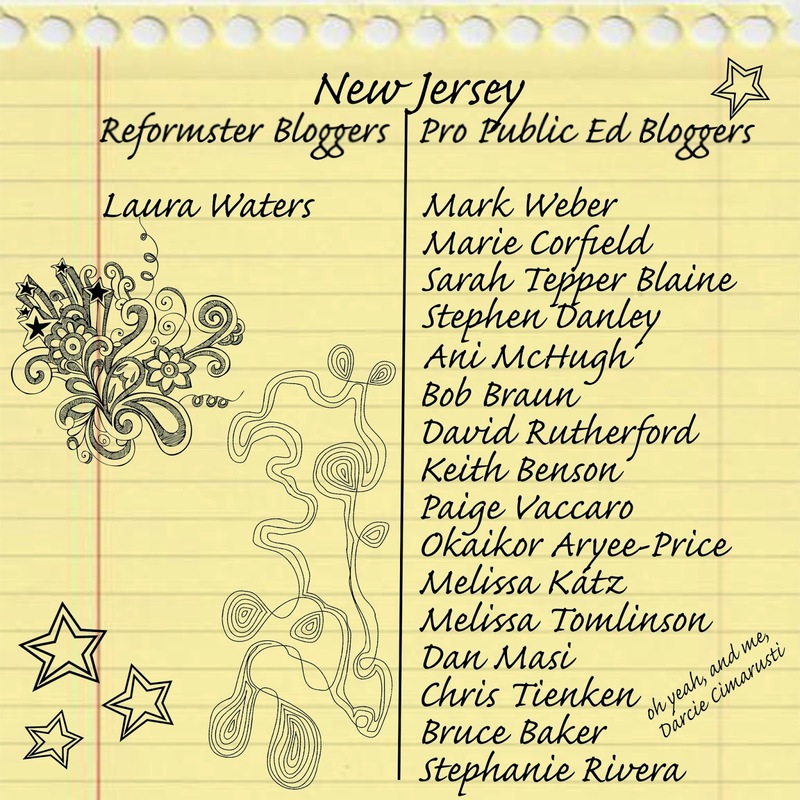 Our unfunded, rag-tag bunch of New Jersey bloggers make them nervous because we are on to their game, we're making noise, and we're gaining ground. We're all in this for the long haul, and as time marches on our ranks only grow deeper and stronger. If corporations really are people then Pearson must be crying in his coffee right about now. First, Pearson received a thorough skewering at the hands of John Oliver. As one might expect, the Oliver bit went viral on social media. On the Last Week Tonight Facebook page, the video has been viewed almost 3.5 million times, and has been shared 56,000 times. To date, it's the most viewed video of the season. The only video that has come remotely close to the same number of views was a segment on government surveillance where Oliver interviewed Edward Snowden. The Snowden segment has been watched a little more than 2.6 million times, and shared 37,000 times. Congratulations, Pearson!! You're more frightening to the American public than their own government spying on them. What even I didn't expect however was that the segment went viral in the main stream media. It's been covered by Time, Rolling Stone, the Wall Street Journal and even EdWeek among a host of other major media outlets. Then the brilliant Valerie Strauss reached out to Pearson and asked if they wanted to respond to the segment. Seems they thought this would be a good opportunity to do some Crisis Communications. Pearson's chosen Pitchman is a fellow by the name of Alfred Binford. Pearson sent Alfred out to fight their five alarm PR Fire. Alfred was described in the post as the "managing director of assessment and direct delivery." Whatever the heck that means. A quick perusal of his LinkedIn account shows Alfred's only been on the job for 6 months. Before releasing his missive, Pearson may have wanted to make sure the job description on his LinkedIn account matched what they were sending to the Washington Post, since LinkedIn says he "Directs North American Sales and GTM operations across major units for global market leader." His letter sure reads like a sales pitch, and not only is Pearson selling us their test, they're trying to sell us Alfred himself. The best things that have happened in my life are because of my family and education. A single mom made schooling a top priority for my siblings and me, and I am a proud product of the Bronx Public Schools in New York City. Education has always been “access to opportunity” for me and has helped shape me as a husband, dad, neighbor, employee, and citizen. My wife and I want our three boys to get great educations that prepare them to earn good-paying jobs and to find fulfillment in life. Just about every parent knows that so much of future success depends on access to the best education possible. It sure seems like Pearson's PR flacks are putting Alfred out there as the new, fresh, family friendly face of Pearson. And what a coincidence, I found reference to Alfred on the Facebook page of L. Wolfe Communications. And of course, Pearson is listed as a client of L. Wolfe Communications. The article L. Wolfe was hawking goes even further to sell us on the Cult of Alfred. My family is no different. In my new role at Pearson, I am busy with the development and distribution of our assessment and virtual learning solutions, and supporting our dedicated team of professionals who work with educators throughout North America. My wife, Jackie, is putting her undergraduate degree and master’s in business administration to work as a part-time substitute teacher in Georgia. When traveling for work, I am so grateful for her shouldering much of the responsibility for managing the busy lives of our three boys—everything from shuttling them to and from basketball practice and taking them to the latest action movie sequel (that I think are way too violent) to helping with their homework projects. In the midst of our hectic lives, we find one activity that really unites us is family dinner. In the Binford household, we make an effort for the five of us to sit down at the table together every chance we get. Whether at home, or at our favorite local restaurants, this precious time together provides us with a break from our busy lives, and time to talk, laugh (mostly at me) and re-connect. Parents want an honest conversation about your tests and your role in our kids' schools. We are far too smart for you to prop up someone like Alfred and attempt to have him woo us with flowery language about the importance of family and public education. We already know how important these things are, and that is precisely why we want you out of our schools and off of our kids' social media accounts. Meet the real Alfred "Industry Leader" Binford. Alfred Binford: Binford has more than 25 years of experience in the communications industry and has worked across a broad range of major markets. Prior to joining MYCOM North America, Binford led the Amdocs Consulting Division to significant growth on a worldwide basis, joining the company in 2010. Before joining Amdocs, he was a senior executive at Vodafone, leading its Global Enterprise business in the Americas. Prior to working at Vodafone, Binford led the Managed Services and Outsourcing businesses for Unisys and, earlier, at EDS. 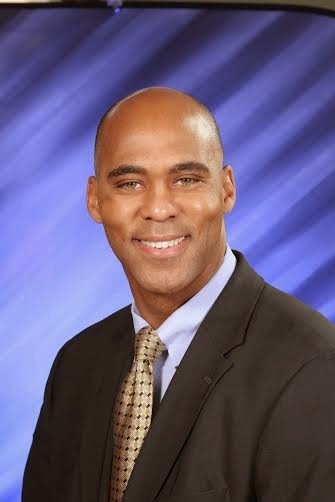 Binford began his career in telecommunications with AT&T where, over the course of eleven years, he held assignments of increasing responsibility across sales, marketing, network operations, and product management. Binford went on to work at Verizon, where he was initially Vice President of Corporate Marketing and Advertising, and later the President and CEO of its long‐distance subsidiary during the startup phase. Hmmm, see EDUCATION in there anywhere? No? Well, I'll be darned. Pearson, your attempt to humanize your company is as big of a disaster as your test. I beg you. On behalf of parents everywhere. The guest post below by Julie Larrea Borst needs little introduction, as the author of the letter tells us everything we need to know about why she is so passionate about the testing revolt currently captivating the nation. I will tell you though that Julie recently helped pen an opinion piece for NJ Spotlight, and she also wrote a guest post for this blog two years ago when she opted her daughter out of the NJASK. It is called Why On Earth Does My Daughter Have To Take This Test, and it's a heart wrenching reminder of how inappropriate standardized tests truly are for many disabled children, not just Julie's. A little background on what got Julie riled up enough to write the letter I have posted below. Earlier today The Leadership Conference on Civil and Human Rights released a statement titled Civil Rights Groups: “We Oppose Anti-Testing Efforts”. Yet we know that high-stakes standardized tests, rather than reducing the opportunity gap, have been used to rank, sort, label, and punish students of color. This fact has been amply demonstrated through the experience of the past thirteen years of NCLB’s mandate of national testing in grades 3-8 and once in high school. The outcomes of the NCLB policy shows that test score achievement gaps between African American and white students have only increased, not decreased. If the point of the testing is to highlight inequality and fix it, so far it has only increased inequality. You can read the entire statement here, and the press release here. Without further ado, here is the bold letter to The Leadership Conference's President and CEO, Wade Henderson, written by Allendale, NJ parent Julie Larrea Borst. I very rarely take the time to respond to press releases by organizations such as yours. However, the release dated today, 5th May, has left me wondering who exactly you’re representing, because it certainly is not me or my disabled daughter. Please allow me to explain why the current testing, and its abysmal 14-year track record, are not in the best interests of students with disabilities (SWD), for persons of colors, or those who are economically disadvantaged. As a parent and a parent advocate, I am in a position to see, on the ground, how the effects of NCLB, and now the implementation of Bill Gates’ vision of Common Core State Standards (CCSS) and the accompanying tests, have grossly underserved those The Leadership Conference represents. It’s easy to understand the draw of the notion that a student’s progress or a teacher’s effectiveness can be quantified. I have a corporate background. I get it. But, this is people we are talking about, and more specifically, people who for whatever reason have challenges that deserve much more than the idea that a test score will help them overcome those challenges. NCLB did not close achievement gaps. It did not lead to better and innovative curriculum. It did not improve US scores on PISA. What NCLB did do is create a really clear map of where the deepest pockets of poverty are in this country. It did demonstrate that attaching “high stakes” (someone’s profession, their livelihood) to a number made for a narrowing of curriculum as everyone was forced to teach to a test. Race to the Top is that program on steroids. For the last 14 years, tax-payer money has been going to support a program that is not focused on raising up students, no matter what their situation. Special education, as I have lived it, in some of the wealthiest areas of this country, has been cut short by the insipid notion that having “higher expectations” and doing well on a test that takes none of my daughter’s disabilities into account, will somehow, magically produce better students, now called “college and career ready.” Anyone with the most basic background or exposure to SWD’s knows this is not true. We also know that all the money spent on testing and on remediation because a single test reported that students are “failing,” has resulted in desperately needed funding not reaching the populations most in need – students with disabilities, students of color, and students who are economically disadvantaged. 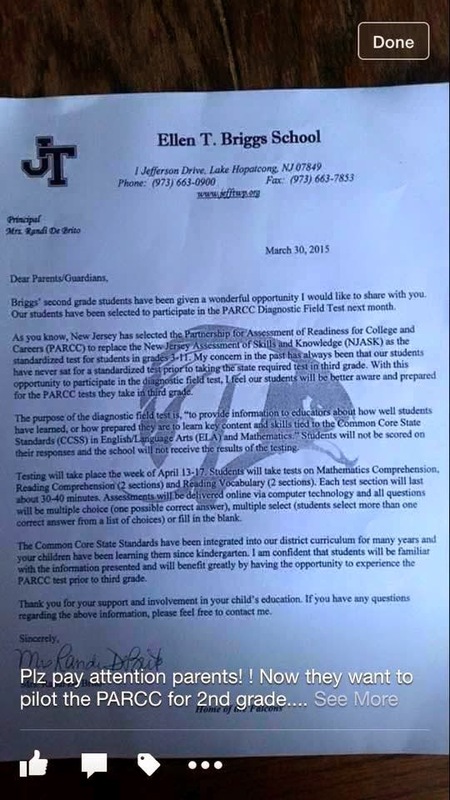 Now, with the onset of CCSS testing -- here in New Jersey it is PARCC -- we have had to deal not only with the complete overhaul of CCSS-aligned curriculum, but also with whatever districts have had to purchase in order to administer this fully online test – infrastructure, hardware (laptops, tablets, etc. ), new technology staff to manage all of this, professional development to administer the test, and so on. Districts, already strapped for money, have still had to find it somewhere. There has been no accountability for the money spent on CCSS or the testing. Do you think special ed programs didn’t suffer because of this? Do you think in areas with poverty that money could not have been spent on more meaningful things such as - textbooks, art supplies, and afterschool programs? What exactly was wrong with the grade span testing pre-NCLB? And why are you not advocating alternative assessments, such as NYC’s Performance Standards Consortium, which allow students like my daughter to show what they can do rather than simply fail a standardized test. It is disheartening to hear organizations like yours, and the ones that comprise your membership, speak out against the one action that has actually gotten attention after years of parents being ignored. It is astonishing that your civil rights group doesn’t recognize civil disobedience when you see it, and what’s more, you condemn it! Please, I implore you, take the time to understand what these standardized tests provide in terms of usable data. Receiving a “not proficient at grade level” designation is not even remotely helpful, especially when true diagnostic tests are available. Speak to parents. Speak to teachers. I would be happy to have a discussion with you about testing, about special education, and how organizations like yours can help those of us living through this morass called public education. 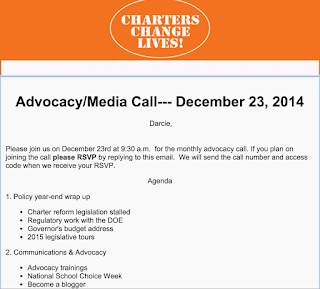 GUEST POST: So, Does The Opt-Out Movement REALLY Have A Race Problem? When Robert Pondiscio asked, "So, does the opt-out movement have a race problem?" and used New Jersey's exploding opt-out movement as his exemplar, he awoke the Jersey Girl in Sue. She just had to respond, and I just had to give her a place to do so. Follow along as Sue masterfully flips the script back on Pondiscio. Robert Pondiscio's article, Opting Out, Race and Reform, is another example that tried and true practice of lumping people into a group and discounting what they say because of who they are. And worse, Pondiscio has not done his research. For an opt-out movement to catch on, certain criteria must be in place— things like democratically elected school boards, open-minded and respectful superintendents, and teachers with job security. But, by design, these things have been removed, systematically, from urban communities, so that policies can be put in place that community members (mostly African-American or Hispanic) have no say in. So, I have news for Pondiscio— it’s not the opt out movement who has a race problem. Cami Anderson, the superintendent of schools in Newark... is facing the predictable shrieks of protest from the defenders of the status quo. much of ​(Cami Anderson's) opposition is shrill and unreasonable. None of these reforms is guaranteed to succeed. But it is sensible to lean on the best charter schools for help, give principals control over their staffs and make sure each ward has plenty of school choices. 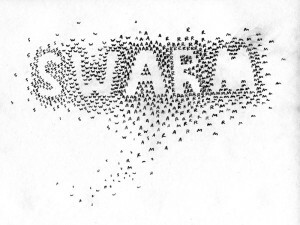 If that stirs up a bees nest, then so be it. As both Jersey Jazzman and Bob Braun ​have ​pointed out, the language here— Shrieks, shrill, unreasonable, bees nest—have uncomfortably racist undertones. The strength of these words for those who wield them is that it means that whatever these “shrill, shriek” protestors say is not to be taken seriously. While Pondiscio’s article is commenting on the relative privilege of an entire group of organized, committed and well-informed parents (and this is a far cry from the much worse crime of racist language), he shrugs off their message because they are “white surburban moms” whose own selfishness is preventing poor and minority children of “benefiting” from testing. If you disagree with ed reform, you are either a shrill and shriek uneducated minority, or a whiny, selfish, white woman. When it comes to criticizing ed reform, you can’t win. I thought Montclair was full of black people. Active, vocal, black people. Brown people too. I thought I was black. So did my children, who had no idea they are white—or rich (yay!). But these are the facts about New Jersey, according to the reformers: only wealthy white liberals are opting out of PARCC. As someone who has studied the opt-out movement in New York, I believe that opt-outs have a place in the protestor's toolbox; but so do old fashioned walk-outs, demonstrations and sit-ins. This past year, many urban communities in NJ have come together to protest with great voracity. Ms. Edmondson mentions the student protests in Newark. A shining example. She could have also mentioned this notable opt-out in Paterson, these protests in Newark over privatization, or the student-walk outs in Camden. If the community in these cities chooses other forms of protests instead of opt-outs, let’s believe that they have assessed the situation and executed their best strategy. Opt-outers everywhere feel they are taking a risk in order to participate in this form of protest- it is stressful, it feels risky, it involves their child, and there are a lot of unknowns around punitive measures that might be taken against them. So, often, a strong opt-out movement requires a certain pre-existing set of community criteria that must be met so that those risks are mitigated. Only then do people feel comfortable joining, and only then can the opt-out movement spread in an area. So what, then, helps an opt out movement prosper? 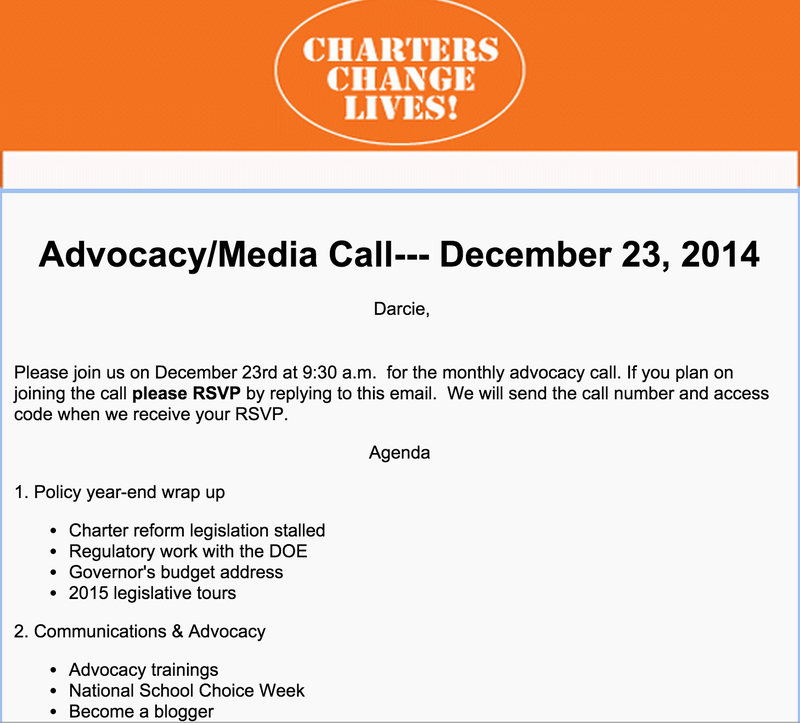 And why would an opt-out movement struggle to gain a foothold in an urban city in NJ? I’ll use Camden as an example since it is the city I am most familiar with. First, the opt-out movement is boosted tremendously in an area if the district superintendent is supportive. Long Island superintendent Dr. Joseph Rella was an early supporter of the opt-out in his home district. Dr. Rella stands firm in his support of the choices of parents in his community, even as he is pressured by the NYS DOE to do otherwise. Accordingly, his district had a high opt-out rate. Other superintendents have followed his lead in New York, and recently over 100 superintendents have signed a letter of protest against high-stakes testing. When superintendents speak out, parents are empowered to actively refuse tests. ​And of course, in Camden, Superintendent support will never happen. Second, teacher support and teacher connection to community is key— and these are precisely the relationships most disrupted by ed reform policies in Camden. Many members of the opt-out leadership team on Long Island have close friends or family members who are teachers. Many “white surburban moms” in Long Island first found out about the testing madness informally, while chatting with teachers who are also members of their community. In Long Island this winter, Beth Diminio, a brave teacher from Comsewogue announced she would be the first teacher to opt-out of administering tests, bringing additional energy to the movement. When trusted, highly-respected teachers say that the tests have little value, parents listen. 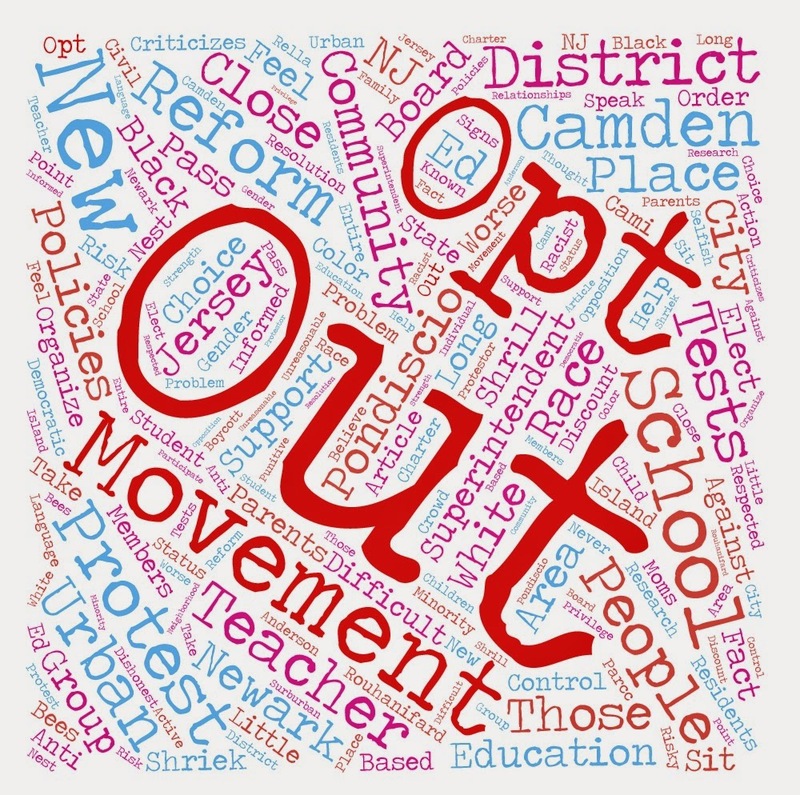 If you were a teacher in Camden or Newark and you felt the target on your back, would you stick your neck out to support an opt-out movement? I would sure think twice. It is highly unlikely they would ever pass a resolution that stands in opposition to the party line. Fortunately, in New Jersey, Save our Schools NJ is working to pass anti-sit and stare resolution at the state level, the first step of which has just passed unanimously. And finally, the closing of schools and the reshuffling of residents creates an environment that makes it very, very difficult to organize. If you sent your child to a school for six years, and then that school closed and you were forcibly moved to a different school in a different neighborhood— it would be much more difficult to forge the type of relationships that lubricate community organizing efforts. I hope that outcome is not one that is part of the grand ed reform plan, but if closing schools and shuffling families around makes it harder for them to organize against the reforms, I’m sure that will suit the district just fine. So, before Pondiscio criticizes residents of Camden and other urban areas for not being part of the opt-out movement (or, criticizes the opt-out movement for not including the urban districts) it might be wise of him do a little research, and think more broadly, more contextually about why opt-out might have trouble gaining traction in an urban area in NJ, in favor of other forms of protest​. Opting out is perceived as a personal risk, requires strength in numbers, and a great deal of mechanisms in place— most of which are extremely difficult to obtain in these cities. Difficult because of policies that have been put in place by a state government that seems to care very little about the choices of urban residents, despite their hypocritical rhetoric. Difficult because schools have closed and churn has occurred, and difficult because trusted teachers have and will be fired. To accuse the opt-out movement of having a race problem is to miss the issue entirely, and to discount all other forms of protest in urban areas is dishonest and inaccurate. 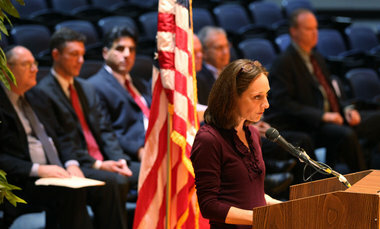 Sue Altman is a proud product of New Jersey's public schools. 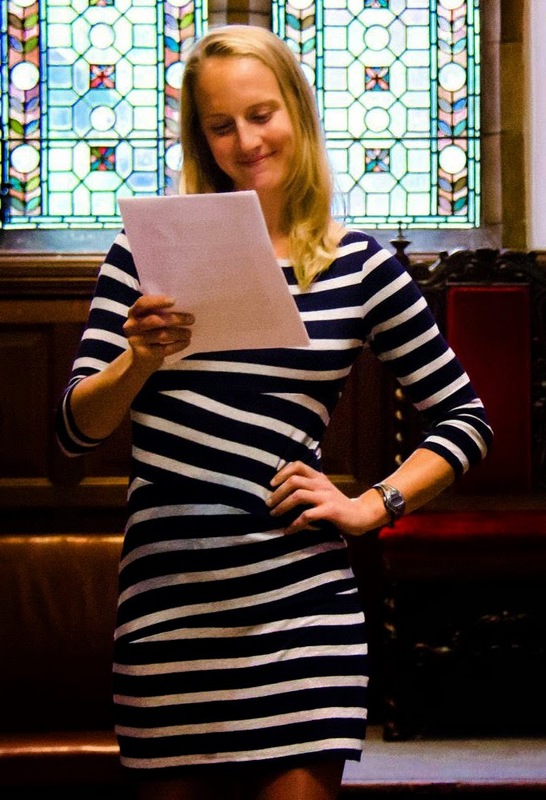 At the University of Oxford, UK, Sue received a dual degree in International and Comparative Education and her MBA. Her MBA thesis focused on evaluating the the opt-out movement as a market-response boycott. She is currently an administrator at an independent school.